it’s fast – on most days, the programme should fit within 30-40 minutes, leaving some time for stretches and shower. Perfect for working week training. it varies every day for 5 weeks – this means that with every session withing this 5 weeks, a new routine will be performed to continuously “surprise” the muscles, encouraging muscle growth and fat burning. After 5 weeks, there can be a week break, which makes this programme perfect before planned holidays. There are two days of rest and one day of light exercise per week in this programme. I found exercising Monday to Friday suitable for my needs, but the days can be varied. I also jogged to gym every day, which was about 5k. With a backpack full of change, lunch box and water bottle. I was crazy fit. It’s unbelievable to me now that I was actually not entirely happy with a level of my fitness at a time. I can only see how totally buff I was after I haven’t been on any normal exercise schedule for 3 years and gained a few kilos. I also took some classes sometimes or danced like mad in gym studio. But these are of course optional additions to the weight programme. In the tables, the first number after the exercise name is a number of sets, following by repetitions for each set. 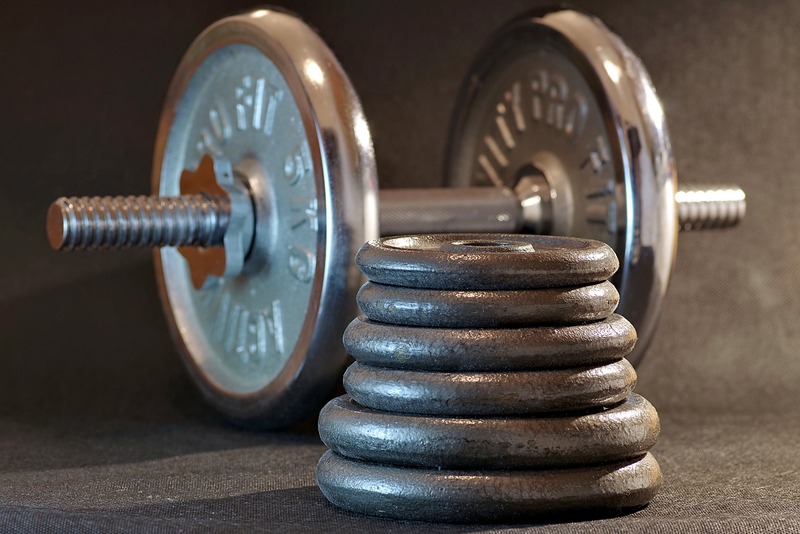 Lower repetition range (4-8) means heavier weights – as heavy as possible to perform said number of reps, higher repetition (8+) equals lower weight – just high enough to finish the set. It is important to limber up before each session and finish off with stretches. Warm up and stretches should correspond to muscle group exercised. I suggest some suitable warming up and stretches routines, but they could be different. Equipment needed for this programme: bench press station with various plates and adjustable, removable bench, lighter barbell and kettlebell (10+kg), set of good dumbbells, RedCord trainer or any other suspension trainer, pull up bar, dip station, Swiss ball, resistance bands, balancing cushion. Optional: Romanian chair, medicine ball, aerobic step. Abbreviations and shortcuts: amap (as many as possible), DB (dumbbell), BB (barbell), alt. (alternate), HIIT (High Intensity Interval Training). This exercise plan requires gym equipment and designed for experienced users. Stretches: yoga arms stand practice. *Smith machine is good for these or a lighter, shorter barbell. ***or any other cardio class with arms involved. I found dancing most suitable, because you don't bear any weights, just move your arms a lot. ****Romanian chair is great for doing this with weights. *Loop the resistance band around secure barbell on the smith machine or bench press. The band should be on chest level. This is the two arm crossover for reference. ***these can be done lying on the bench, sitting or standing. With one or two dumbbells. balancing on one leg - on soft cushion/balance pad. *use a barre or secured barbell for support if needed. **use step or some other sturdy elevation. Medicine ball can be used for a challenge. ***Those are tough, use resistance band or pull up machine for assistance.